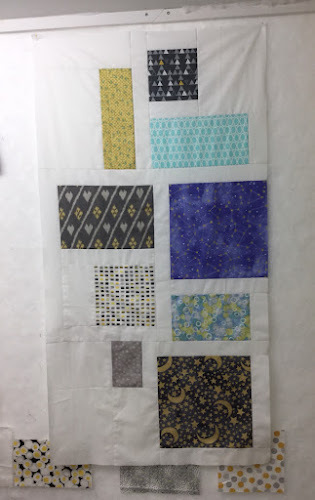 I've started another in what will probably be a series of modern type baby quilts. It's what our daughter has requested for their nursery. Rather than having her pick specific patterns and then fabrics to go with them, I'm working with the colours and theme that she wants and then she can pick her favourites. It's hard for non-quitters to see the vision of what the pattern and the fabrics will look like once together. So, rather than asking, I'm just doing them. One great thing about these modern quilts that have tons of background in them, is they sew up really quickly. I'm so used to doing small pieces and complex designs that this quick and easy thing is fun with almost instant gratification. I just have three more coloured pieces to place into their surroundings and then can sew the whole thing together. 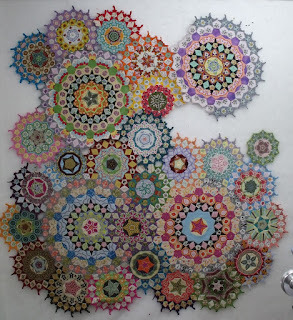 It just might be the proverbial quilt-in-a-day. Actually, no it won't. 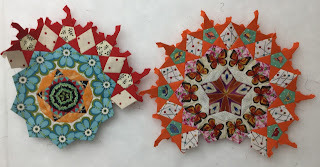 There are borders to cut and assemble, and I don't think I'll manage to get those done today. So maybe it will be a quilt-in-two-days thing. This quilt, I should mention, is from the Quiltmaker magazine Jan/Feb 2014. It's called "Black Tie Affair", designed by Margie Ullery. The original quilt in the magazine was done all in blacks and whites, with just a smidge of grey. 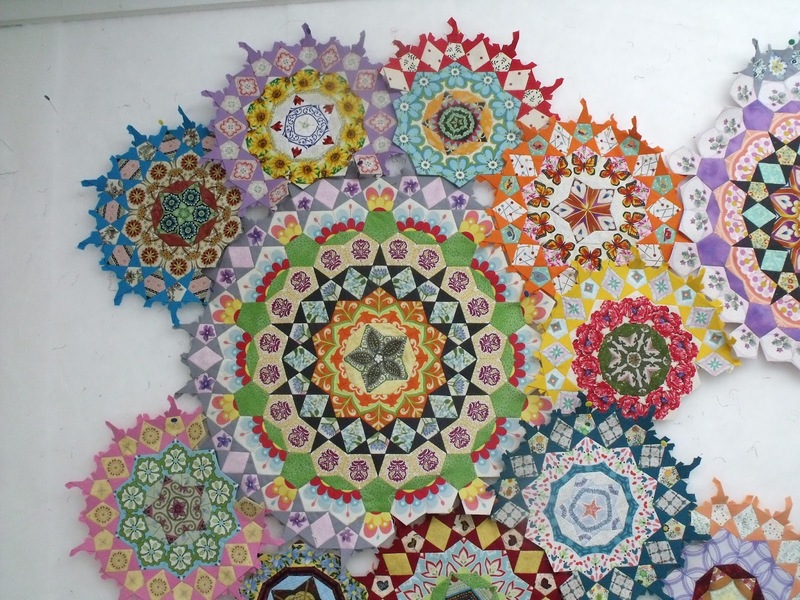 She has a website called ribboncandyquilts.com. We were away for the weekend, visiting Avery for another camping sleepover. I had such a good time, I did very little stitching, and took only one picture. The rest of the time was spent playing and watching and laughing. And I have come to a momentous decision....... very little on earth feels better than holding a little boy's hand! Although holding a newborn baby would be right up there, too. Anyway, that's slightly off topic. What little bit of stitching that got done, was in the car on the way home. This rosette is ready for its stars. It's one of the last 5 or six that I have to do, depending on whether I do any extras. Now, lets see, how can I say this in a way I haven't said before......... not much stash out, more stash added in..... how's that? But it's all for a good cause, the baby, as yet unknown whether boy or girl, due for our daughter in January. She's doing a themed nursery decoration based on the saying "I love you to the moon and back". So there are stars and moons, to go with the grey/yellow/purple colours she wants. I have a couple more patterns picked out, so the numbers should change a bit, soon. I'm continuing to work on the Pamuya shawl. It's actually to the casting off stage. We're heading out in the trailer for the weekend, going to see our grandson Avery. 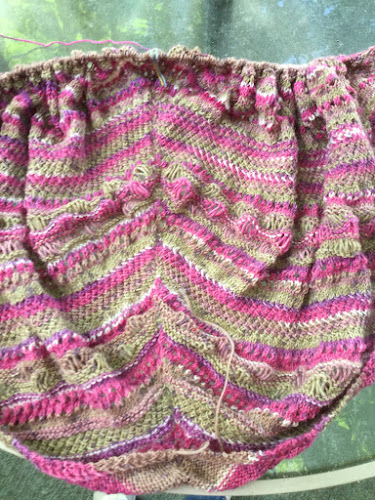 There should be lots of car time knitting which just might be enough to get this done. It's really hard to tell what the final shawl will look like. It needs a good soak and some heavy duty blocking first. I've been doing a lot of customer quilting this week, and a lot of stitching on La Passacaglia. No pictures to share of either of those, at the moment. We should be home on Sunday in time for a hand stitching post then. I seem to be averaging every other week on these posts lately. My hand stitching has slowed down a bit, as I begin to work more on machine projects. There's a commercial on TV here days showing a woman cloning herself so that she can get all kinds of things done all at the same time. I would love to be able to do machine sewing and hand sewing and knitting all at the same time. Sadly, not possible. But I am still leaving Sundays for my hand stitching. I have completed 3/4 of La Passacaglia. Here's a close up of the section I've just finished. 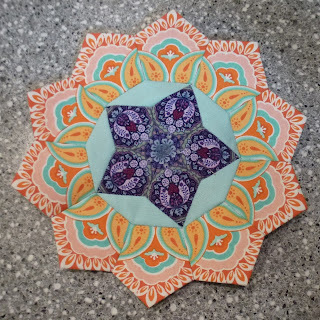 I just have the rosettes that go around the top right section left to do, unless I decide to do a few extras to fill in some spaces. 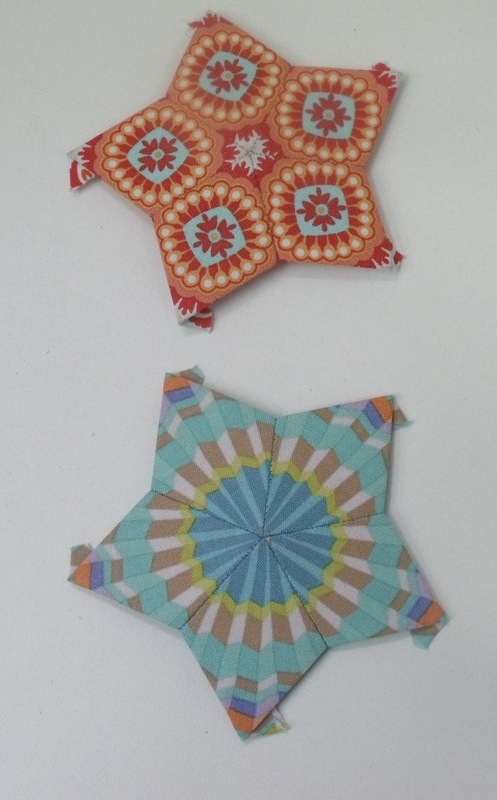 With that in mind, I've done up a couple of the centre stars needed for the new rosettes. There is at least one more kicking around here that is finished, but it seems to have temporarily gone missing. As far as the stash report goes, there has, of course, been stash added. 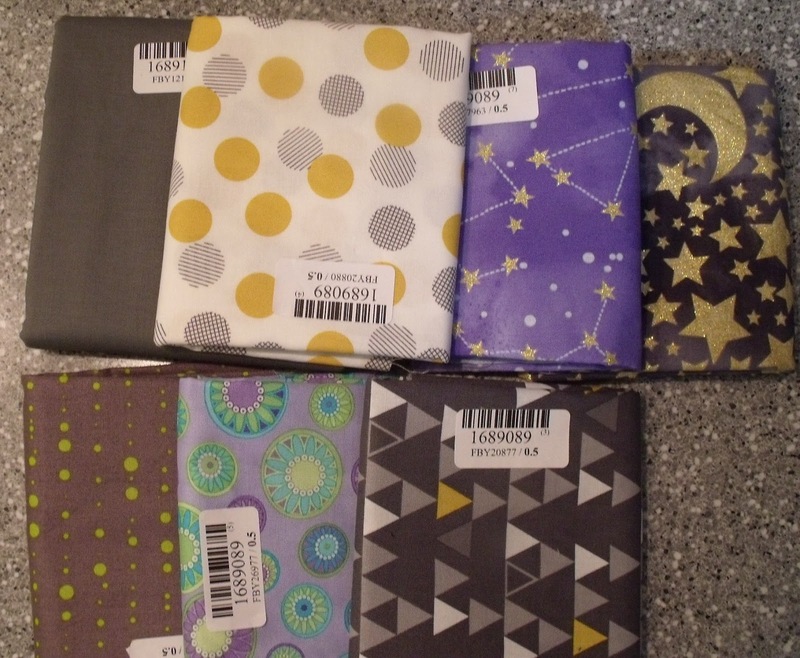 No self respecting Grandma-to-be could possibly avoid ordering new fabrics for new baby quilts for a new baby. At least, that's my story, and I'm sticking to it. 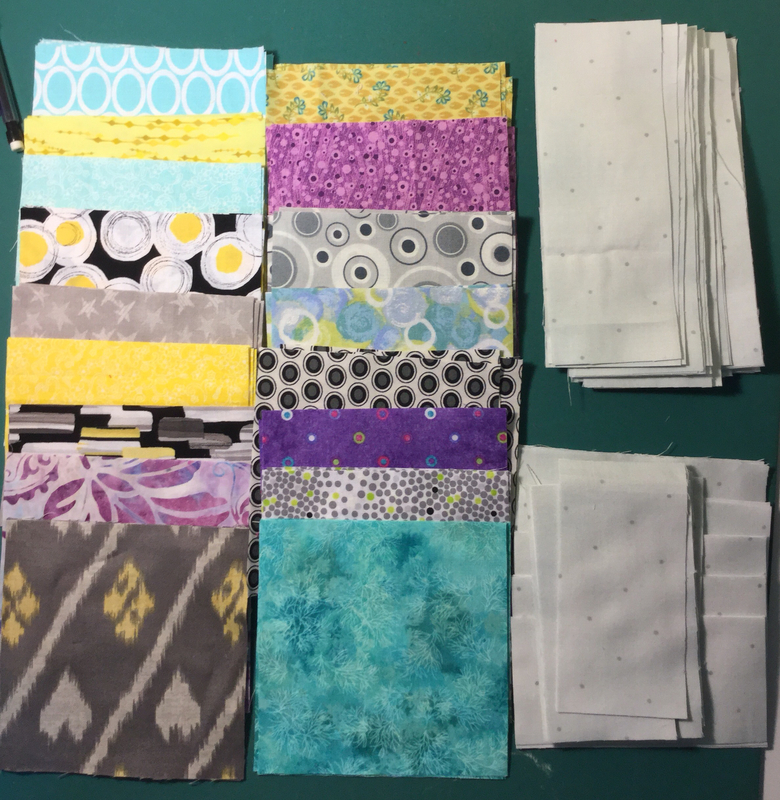 I did use some of that recently ordered stash to make up one baby quilt already. It's a pattern called Ribbon Waltz, found here. I've already found another design I want to do, so there should be some more stash busted in the next week, or so. And in the meantime, I'm having a blast! And the best of all..... our grandson or granddaughter-to-come gave me a lovely kick hello this morning!! 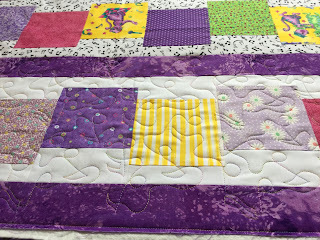 As usual, I'm linking up to Judy's Fabric Report and Kathy's Slow Sunday Stitching. Then, it's back to more slow stitching to go with a lovely cup of tea. Today and this evening find me up in the studio. I seem to be getting over the being creeped out up here after dark, which is a really good thing. This morning I started a new customer quilt. An absolutely gorgeous One Block Wonder. Last evening, after taking an informal Facebook poll, asking whether I should work on La Passacaglia or start a baby quilt, the results came back unanimous for starting a baby quilt. So, I cut out a bunch of fabrics into the sizes needed. And tonight I sewed them together into blocks, put them up on the wall, and rearranged until it looks balanced with a good distribution of colours. And I think now I'm done for the day. It's been quiet on the blog lately. It seems to be the thing that is getting neglected when life is busy. I'm working on this quilt right now. It's scrappy in all different shades of blue. The owner wanted waves to bring out the thoughts of water. 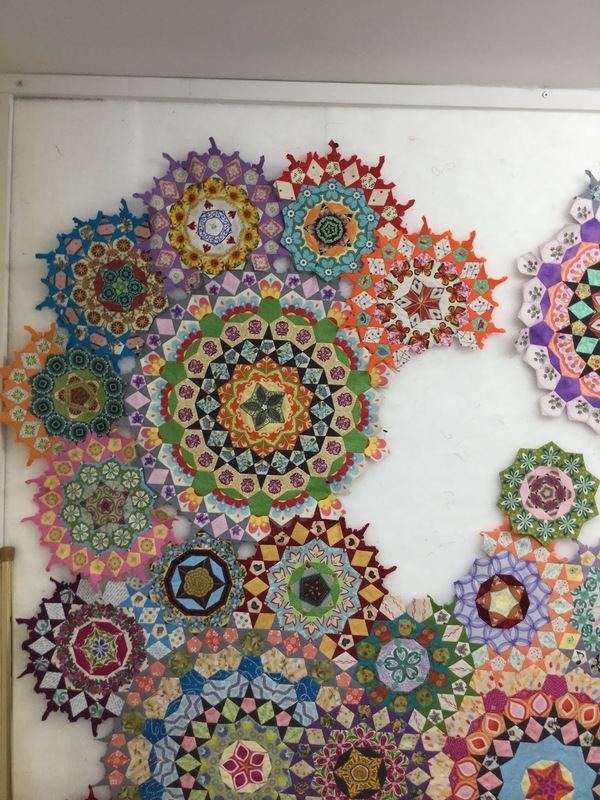 The piecing is large scale, so I made the scale of quilting large as well. Time to get back at it. 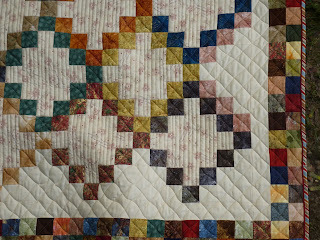 This quilt was designed by Judy Martin, one of my all time favourites, and is found in her The Creative Pattern Book. 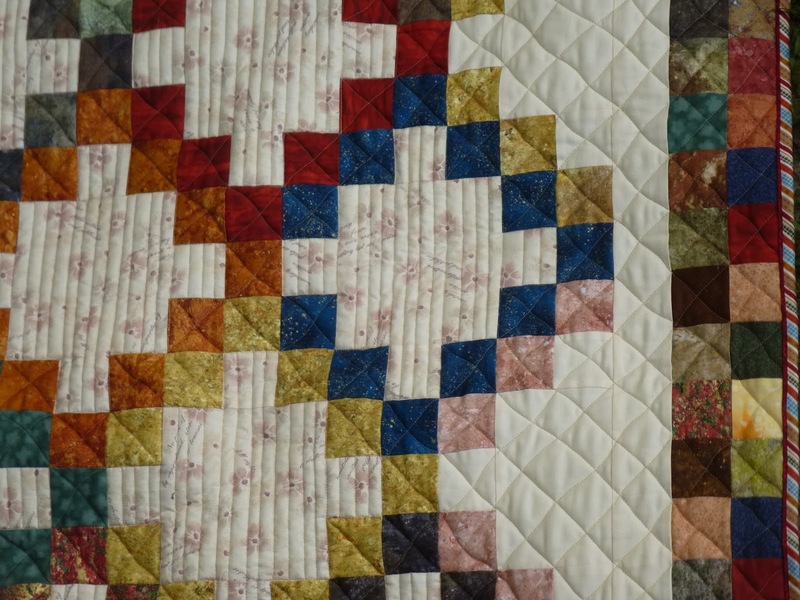 The quilting design is taken directly from a diagram in her book. I saw it, loved it, and wanted to replicate it. The only thing was that it was diagonal cross hatching, ordinarily requiring a lot of time consuming ruler work, and I didn't want it to take that long. So instead of using a ruler, I did a wavy kind of cross hatching, sometimes called "organic". I used a new to me type batting for this one, called Tuscany Wool, from Hobbs. 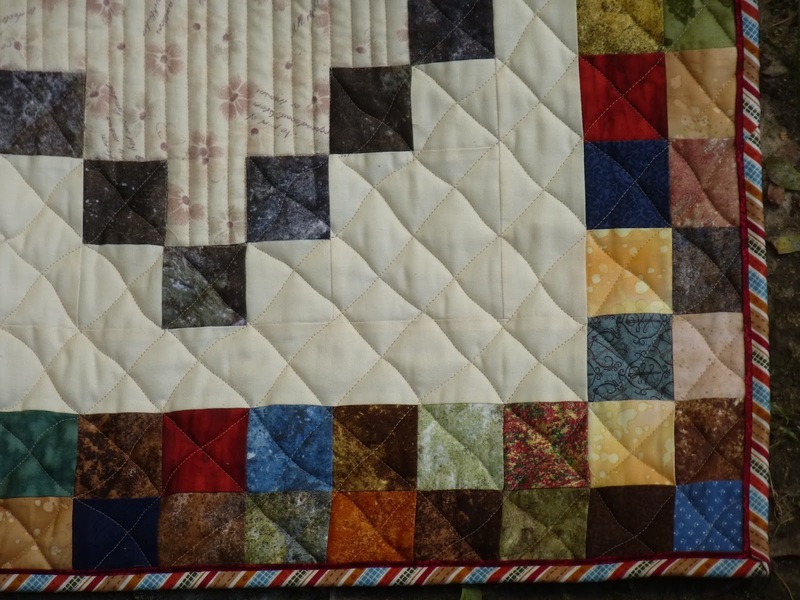 I can't say that I really like the way it behaved while doing the quilting. It has resin added to the surface of the batt, supposed to stop bearding, but it made it act like a stiff polyester batt. 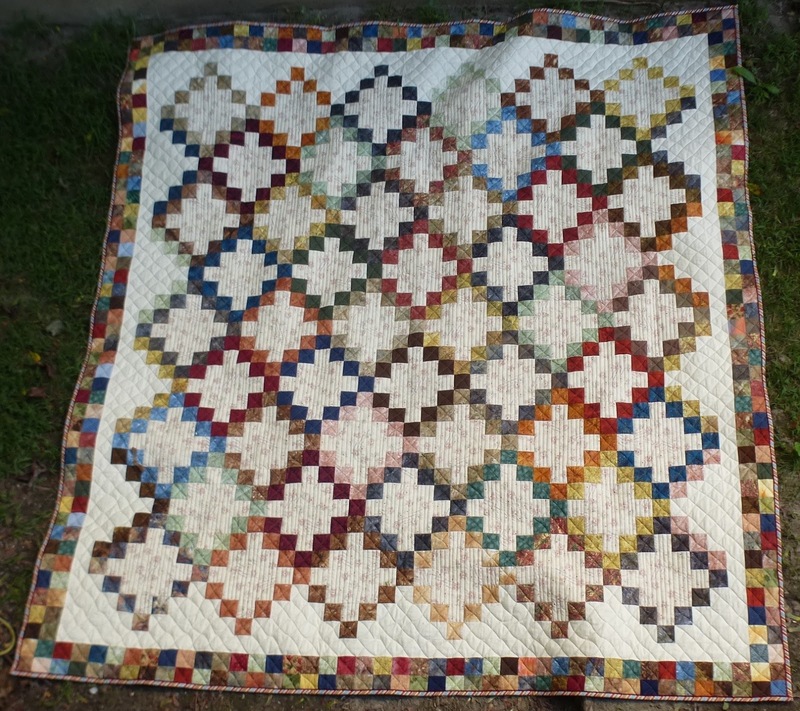 The wrinkles from the packaging never fully relaxed, and the quilting came out like a thicker polyester batt. 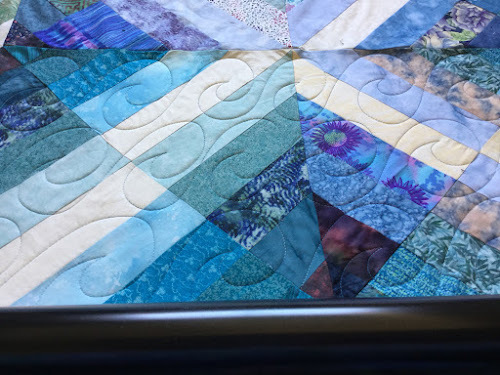 I can see that this batt would have definite advantages for doing quilting that needed a lot of loft, like some of the more modern quilts need. 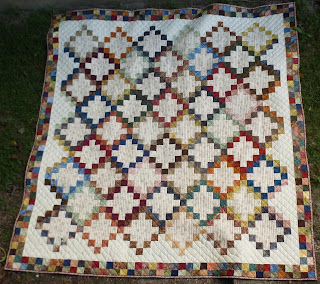 However, after saying all that, the quilt, now that it is finished, is wonderfully light and airy. I put it on the bed last night, and it was really comfortable to sleep under. I haven't washed it yet, and the instructions say to use tepid water in the machine on a gentle cycle, and lay flat to dry. The gentle cycle I can do, lay flat to dry, on the other hand, is not going to happen, so I have no idea how it will behave in the dryer. I'll have to check my dryer for a gentle cycle, or maybe Matt and Becca's new dryer will have one. So the jury is still out as far as using wool batts. I'll have to work up the courage to put it in the washer and dryer before I know for sure. I'm going to link up this finish to Crazy Mom Quilts. 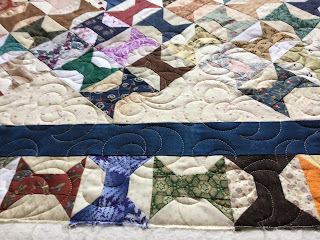 Then, since I am doing the blog for the London Friendship Quilters Guild this year, I need to go through the photos of last night's meeting, and see which ones are good for use. I was using the guild's camera, so it's not familiar to me for its functions. 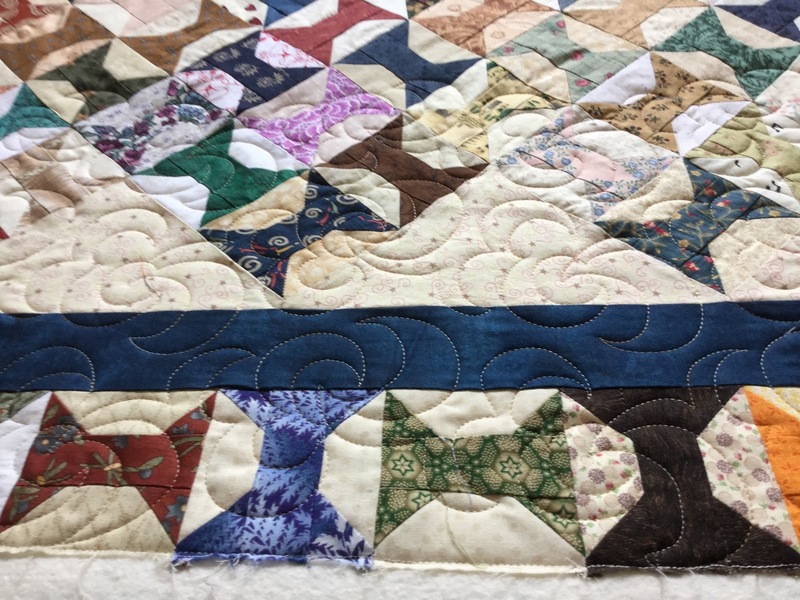 In case you are interested by the way, there is a free sampler quilt being run on that blog this year, just starting now. 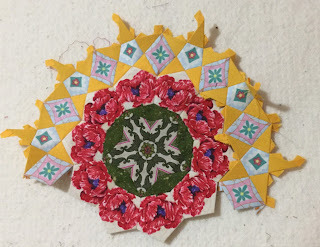 I have three more small rosettes almost finished for La Passacaglia. These two are finished, and in place around the top left hand section. 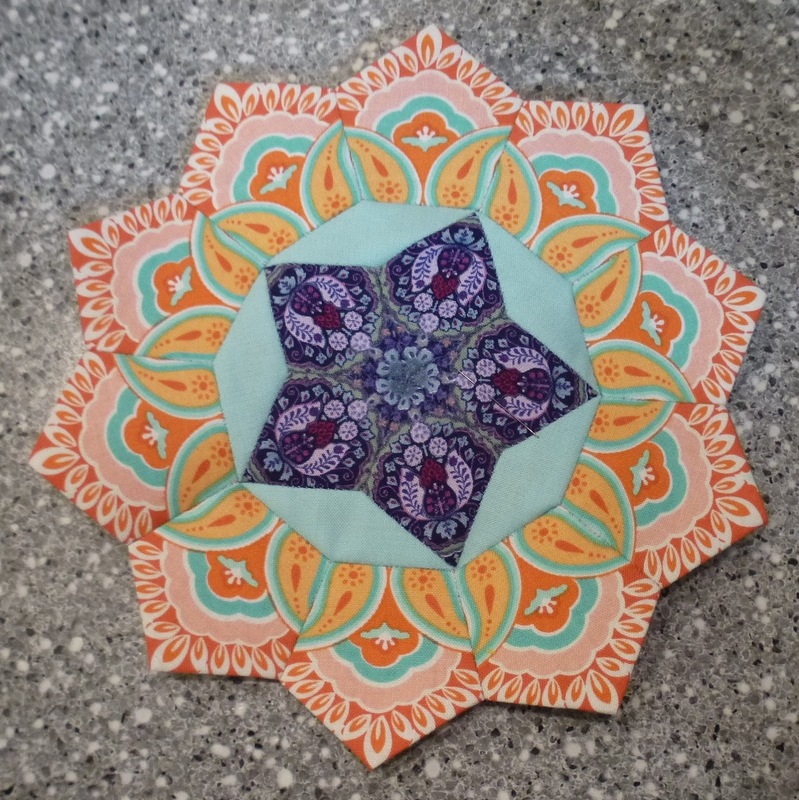 I have a couple more of the yellow stars to stitch down, and then this one will go underneath the small orange one. I was hoping to have this one done, and in place tonight, but I can't find my thimble, and my finger that pushes the needle through is starting to get sore. After this, there's one more to do, and that centre section is done! So close...... so very very close to being done! 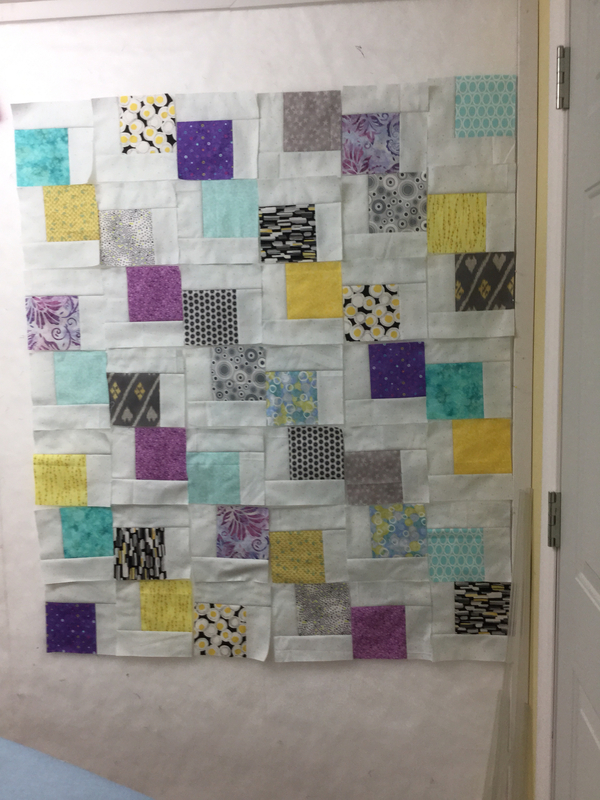 I managed to get a backing made for Texas Chain, as well as the last borders done, and I get to count all that as used this time. It really isn't helping my numbers, at this point, but I sure am having fun adding to those numbers! 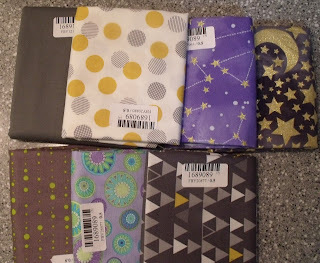 I'm collecting fabrics for baby quilts for our going to be arriving in January grandchild, so the stash added numbers are going up. Whether they come back down again will depend on how many baby quilts I get done. Because we all know there will be more than one. Net stash added: 27.15 yards. 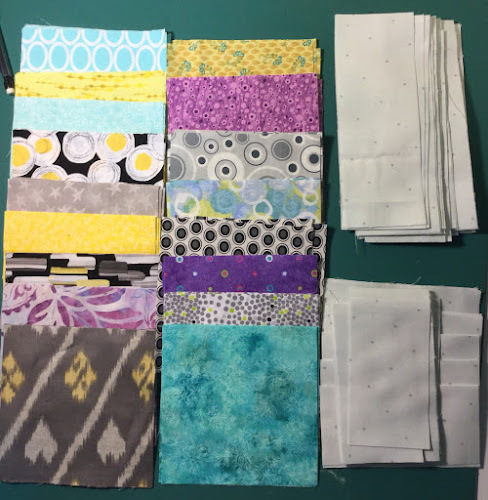 We've been talking colours and designs lately, Becca who is the mommy-to-be, and I so as soon as I get a chance, I can start sewing up quilt pieces and baby quilts. She's 21 weeks now, and definitely looking like there is a baby coming. She says she's feeling it moving a lot, and Matt's been able to feel the odd kick or two as well. It's getting very exciting!! I'm linking up to Judy's Fabric Report, Kathy's Slow Sunday Stitching and Angie's WIPs Be Gone. I haven't checked out any of the links from other people on those sites yet, so I just might do that now, and give the tip pf my finger a rest. 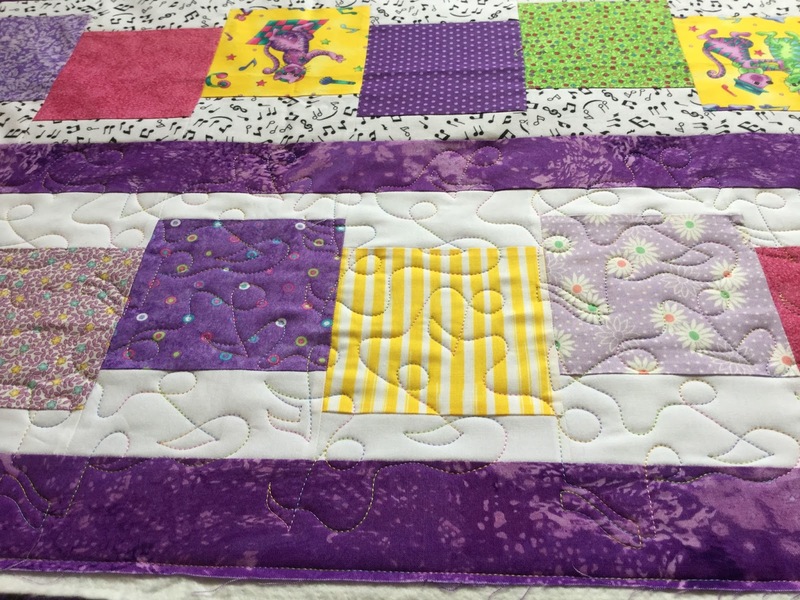 I loaded Mibsie's quilt onto the machine today. It's a fun very little girl type quilt with music and dancing sock monkey's on it. I love doing fun quilts like this. 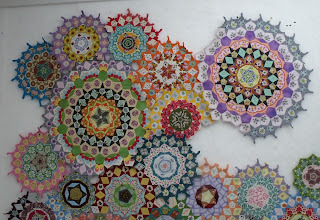 I'm hoping to finish it up this afternoon and then load one of my own quilts to do over the weekend. I finished Texas Chain last week, and got the backing done, as well. I have a queen sized wool batt upstairs that I've been wanting to try out, so now is the time. There isn't a whole lot else that's new going on around here, other than I've taken on a new project. I volunteered last year to do the blog for the guild, the London Friendship Quilters' Guild. 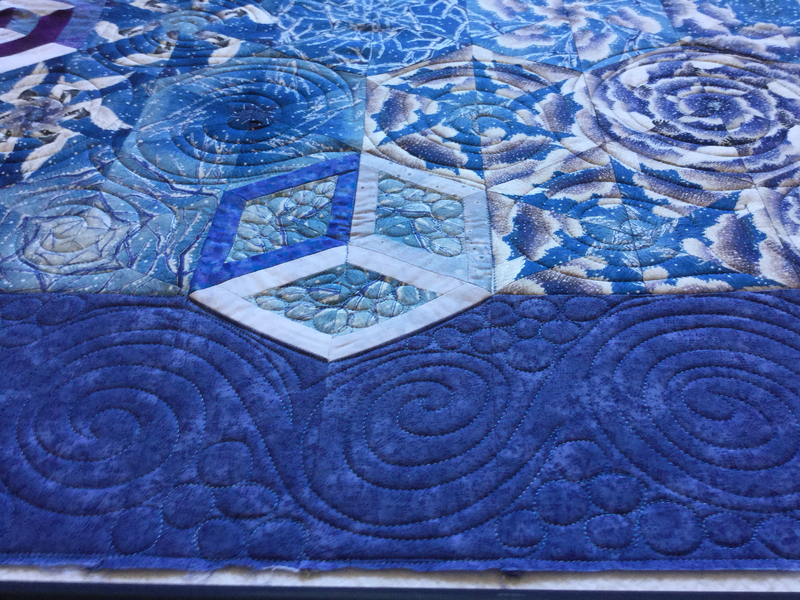 Seeing as how I love designing new quilts in the Electric Quilt software, I did up a design for a sampler that is going to be presented on the guild's blog. The link for that sampler is here, if you'd be interested in playing along. The blocks will be posted the first and third Thursday of the month. If there's a fifth Thursday, I'll post one then, as well. When I post them on the guild blog, I'll try to remember to post the link here. And now, it's time for a glass of ice cold coke, since it is quite warm around here today, and then it's back to work. How did that happen. Summer just started, we were planning for all our vacations and trips and looking forward to them, and now it's gone, it's over. And although we have lots of wonderful memories, the first of September always makes me a little sad. 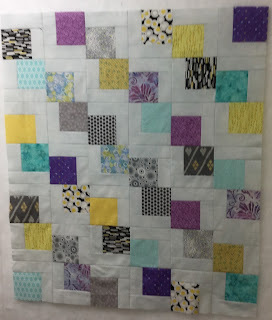 I loaded a customer quilt today, and am hoping to have it done by tomorrow afternoon. I'm using a new to me pantograph called "Eclipse" and I really like it. I think I'll use it on one or two of my own. There are a couple that are waiting that this would suit very well. But in the meantime for this evening, I think I will take it easy, put on netflix and do some stitching. If I push myself too much too soon, I'll be back to being the blob on the couch. I think I have some orange stars for La Passacaglia to keep me busy.